Clearly, student loans, Brexit and recent economic challenges have done little to put people off pursuing their education to the next level. Competition between institutions for those with the greatest potential is intense. If you’re not familiar with the Higher Education sector, you might be surprised by how many marketing activities take place to attract applications, and this includes a large number of events. 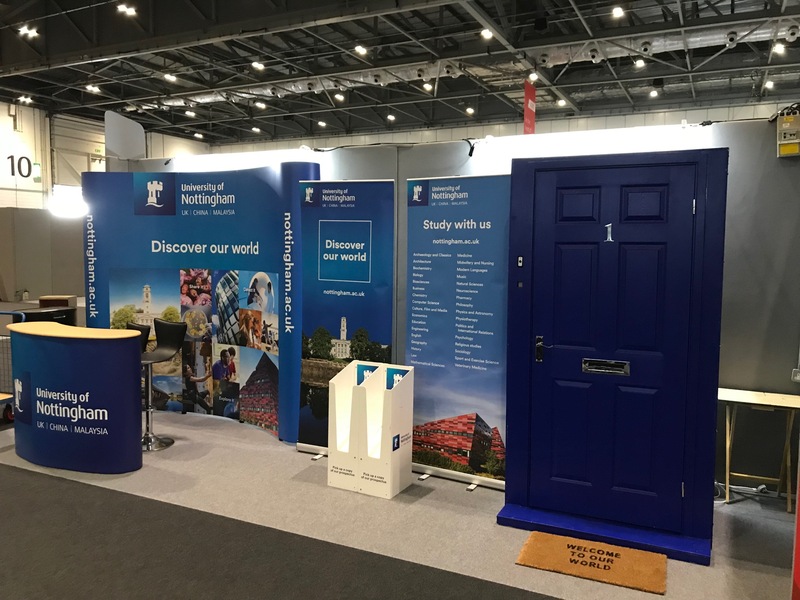 To stand out in the UK’s university sector events it’s important to have a professionally designed stand that always looks its best. That’s why Nottingham University’s events team asked Bill Bowden Events Logistics to deliver and assemble their stand to a series of student exhibitions and to dismantle and store the stand at the end of each event. We’re now talking to other universities and colleges who have been impressed by our work. Some have asked us to help with the design of bespoke stands – something we’re well equipped to help with. It’s our pleasure to be supporting institutions that are educating the next generation. If your university or college is interested in a stress-free way to present the best possible image to your potential students at events, please get in touch. We’d be delighted to help.